It’s the Joker, he’s gone from happy to angry. I think he’s just angry cause he was caught doing yoga. That’s actually a panel from skeleton warriors Or maybe that’s a panel of morbius during the 80s. It’s actually from “Doctor Strange”, Issue 14 I think it is. There’s a whole story arc about how Dr. Strange long ago destroyed all vampires, and now through some cosmic loophole or other they’re coming back. 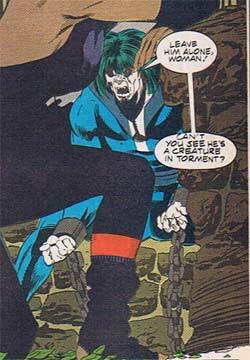 Morbius is caught up in the middle of it since he’s not a vampire, but just has all the powers of one via some virus concocted by the Comics Code Authority.